I was invited to sample gentlemen's afternoon tea at the very classy Neo Bar. It's a hard job but someone has to do it. 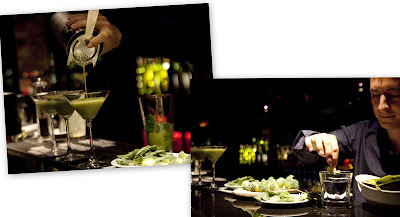 Belvedere Vodka and mixologist Andy Pearson have created very imaginative cocktails. I sampled the healthy version, truly this creation being made is called brainbox as it covers your 5 vege a day with salmon oils, egg whites, green tea and of course Belvedere Vodka. I can hear you saying similar things to me, but I'll bet like me you will be pleasantly surprised at how delicious it really is. To accompany your cocktail chef Joel Edmond has created a number of miniature food treats. All classics you will know, Italian pizza, croquemonsieur, fish cakes to name just a few. Continuing on the healthy theme I finished with a cup of tea. Of course it was not ordinary tea, this was a peppermint tea martini. Amazing sounding place, I must give it a go! So very different from an old fashioned 'Ladies Afternoon Tea' this looks rather special! This sounds very interesting to me. I'd certainly give it all a try. It makes me think of the restaurant True Food here that serves all healthy food and drinks. I enjoy going there to try new things. I'd be game to give that Martini a try! You seem even healthier than usual today. The cocktail sounded perfectly ok until you got to the salmon oils Molly, ewwww! but I'm willing to keep an open mind,if you say it was good, then I'll go with that! Hmmm, I'll take your word for the cocktail! The bar sounds classy, though. Looks all rather posh I must say, trust the British. Nice that you're such a team player! For the team - cheers! Wooo, that sounds very interesting and yummy! It is indeed a stylish bar. I will have to go back a day to see what kind of atmosphere the place has got when there are actually some people in it.